Craving fresh taste? Look no further than this lemon curd whip with berries! Serve up as a cool treat on a hot day, or at your next gathering with friends. 1. Melt the butter, sugar and lemon zest in a saucepot over medium heat until the butter melts fully (the sugar will not dissolve at this point). Whisk the eggs lemon juice and cornstarch together and whisk this into the pot. Continue to whisk the curd over medium heat until it thickens and just begins to bubble, about 8 minutes. Pour this through a strainer and cover the surface of the curd with plastic wrap. Cool the curd to room temperature, then chill completely. 2. The curd will keep, refrigerated, for up to 3 weeks. 1. 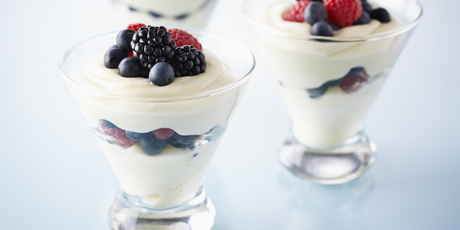 Fold a cup of curd into the whipped cream and layer this in glasses with the berries. This can be served immediately or chilled up to 6 hours.